PwC Malaysia is recruiting in the UK! 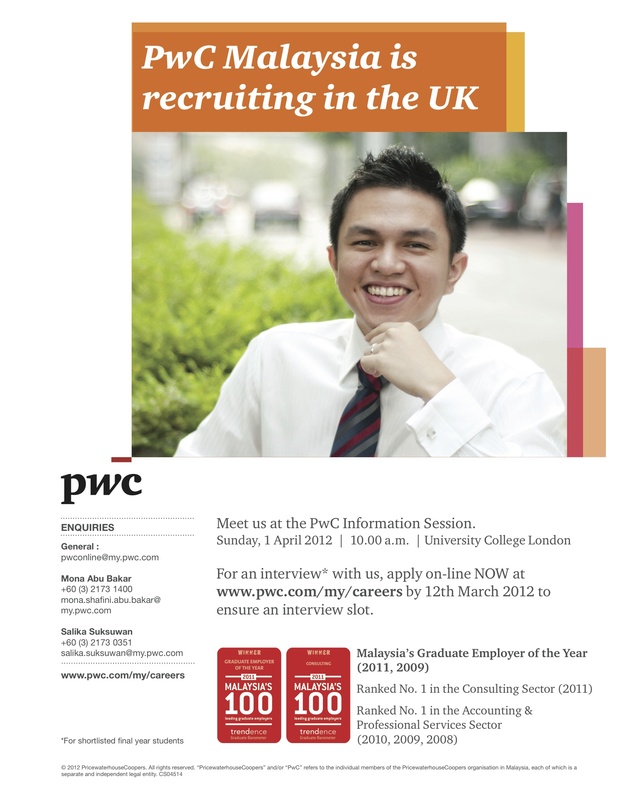 PwC Malaysia is back in London again this year for the UKEC Career Fair. Meet the PwC team at their info session on Sunday, 1 April, 10.00 a.m. in UCL. Final year students are invited to apply for graduate positions in Assurance, Tax or Advisory. PwC interview sessions commence a few days before the UKEC career fair. If you’d like to secure an interview slot, do apply early! Submit your on-line application by 12 March 2012 through the PwC careers website at (www.pwc.com/my/careers). You can be from any degree disciplin- do check out their programme for non-accounting graduates on their website. For more information regarding the career fair, click here.